Do you know my favorite thing about The 4th of July? 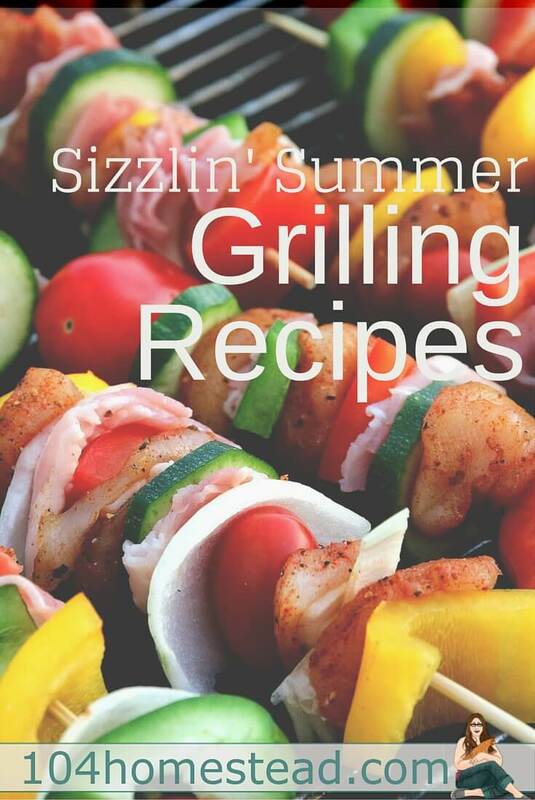 It’s the day I finally get out the grill, clean it up, and start whipping up my favorite grilling recipes. Once I get started grilling, it becomes practically an addiction. The poor stove top gets “put on the back burner” for months. Grilled Beef Heart Skewers (Recipe by Livin’ Loving’ Farmin’) – Beef heart is a super food worth considering. Grilled Trout with Lemon Garlic Butter Sauce (Recipe by Montana Homesteader) – Simple, easy and delicious. Outdoor Cooking: Calzones & Kebabs (Recipes by Tessa Zundel) – I have it on good authority that these calzones are the tastiest thing you will have ever eaten. Tequila Lime Grilled Chicken (Recipe by Better Hens and Gardens) – Tequila, lime, orange, chipotle and jalapeno chili just screams summer. Barbecued Jerk Zaycon Chicken Breasts (Recipe by Perky Gramma Teaches) – For chicken with a kick. Clams & Corn on the Grill (Recipe by Learning & Yearning) – A “vacation at the lake” kind of meal. Grilled Corn on the Cob (Recipe by Montana Homesteader) – Grilled in the husk, this corn is deliciously juicy. Grilled Artichokes with Creamy Butter Dip (Recipe by Delish) – A simple but special appetizer for your summer cookout. Grilled Smoky Cheddar Potatoes Foil Pack (Recipe from Betty Crocker) – Are you a potato lover? Try this cheesy grilled version. Instead of bacon, you could top with red peppers. Grilled Asparagus with Lemon Butter Sauce (Recipe by Montana Homesteader) – Even better than steamed! Peppers, Cheese & Bacon (Recipe by Homesteading on Grace) – A perfect summertime recipe. Grilled Polenta Cakes (Recipe by Two Peas & Their Pod) – Easy to make and so tasty. Grilled Chocolate Cherry Ricotta Pizza (Recipe by Marla Meridith) – Chocolate and cherries are a match made in heaven. Add ricotta cheese, nuts, pizza dough and the fire from your grill. Pure Magic. Outdoor Cooking: Chocolate Banana Boats (Recipe by Tessa Zundel) – An alternative to smores. Grilled Shortcake Skewers (Recipe by Betsy Life) – Grilled fruit is underrated. Campfire Cooking: Rob Roy Cookies (Recipe by Homestead Lady) – Each little, leaf-wrapped cookie is like a treasure or a gift to be discovered. Cupcakes Grilled in an Orange (Recipe by Cupcake Project) – Vanilla cupcakes infused with orangey goodness. Pina Colada Grilled Dessert (Recipe by Vegetarian Nutrition) – Pineapple, lime, and coconut are a recipe for deliciousness. Remember, grilling doesn’t just mean bringing out the George Forman. You can grill on a traditional drill, a portable grill, or even an open fire. Just be sure you are practicing safety first rules. I am a firm believer that children should be taught to cook at an early age (even my preschooler helps me bake), but fire safety is so important. What great recipes! Looking forward to trying some. Sharing your post today and thank you for the shout out.